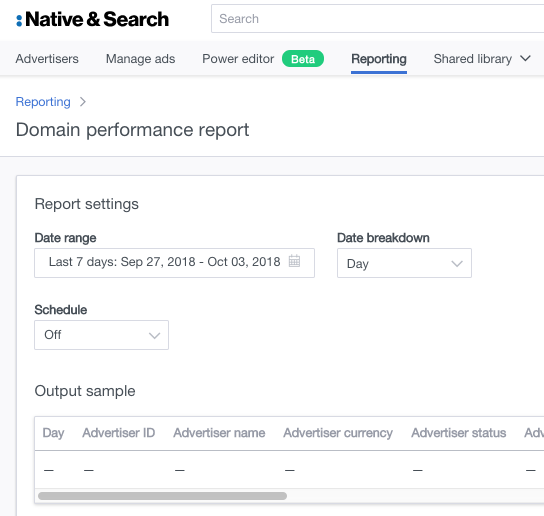 Native & Search Reporting provides you with a flexible way to get the data you need, so you can create different types of on-demand performance reports and prepare those reports for exporting and scheduling. Use Reporting to view different aspects of your campaign, by various elements of your campaign, by targeting attributes, or by specific product features. Click the icon on the right that resembles a clock. Select Create Reports from the dropdown menu. You can create reports to query cubes, which are pre-defined collections of fields. When you query cubes, you can choose the rollup aggregation level, apply various filters, and select which fields you would like the report to include. You can create scheduled reports or generate on-demand performance reports at various levels of the campaign setup, or by targeting dimensions or by specific product features. Campaign Performance Campaign level report showcasing performance per campaign in your account for the specified date range. Ad Group Performance Ad group level report showcasing performance per ad group in your account for the specified date range. Ad Performance Ad level report showcasing performance per ad group in your account for the specified date range. Custom Performance Shows all of the above. Keyword Performance Provides keyword-level performance per ad in the account for the date range specified. Keyword and ad performance for third-party partner Provides keyword and ad level information in a specific format designed for 3rd party tool providers. Configuration of keyword performance reports for integration with providers like MARIN can be done using this report. Custom Keyword Shows custom metrics related to keywords. Campaign performance with ad extensions Provides standard performance metrics (impressions, clicks, spend, conversions, etc) grouped per campaign, per ad extension, showing comparative performance for each ad extension in each ad within the account. Ad extension performance Provides standard performance metrics (impressions, clicks, spend, conversions, etc) grouped by ad extension, for the specific account. This report shows performance of each ad extension within the account. Custom Adjustments Shows all performance metrics for an account, campaign and if the spend was an adjustment (i.e., credited back to you). Custom Product Ads Shows all product ads performance metrics. This report shows the date range and date breakdown for sites or app packages that you wish to block, based on the performance of the site. You can also use performance reports to verify that site blocks you entered were successfully blocked. Domain Site Blocking Shows the schedule and date range for site blocking of domains or app packages. Note that Top Domain refers to the top level web domain where the ad was served. Package Name refers to the mobile package name where the ad was served. Specify the date range, breakdown (by day or hour) and schedule. Once you’ve completed your selections, click Create report. If you see an NA in your report, it indicates that the ad request does not return any data. Data for the domain performance report is available since October 1, 2018. For more information about site blocking, refer to Use Site Blocking for Brand Safety & Improved Performance. To view all the fields available, fields selected by default, and additional group by options, like month and week, click the Show Details button. Only select those fields that you need. The more fields you have, the slower your report. More = Slower, Less = Faster. If you don’t want data by a specific level, remove ALL the metadata and ID’s for that level. For example: If you don’t want data by Ad, remove all the Ad related fields (Ad Id, Ad Format, Ad Title, Ad Description, Ad Status, Ad SponsoredBy, Ad Landing URL, Ad Image URL, Ad Display URL).